06/27/14 General motors llc (gm) is recalling certain model year 2014 buick enclave, chevrolet traverse, and gmc acadia vehicles manufactured march 26, 2013, through august 15, 2013. in the affected vehicles, the engine control module (ecm) software may cause the fuel gauge to read inaccurately. 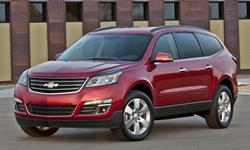 04/27/12 General motors (gm) is recalling certain model year 2011-2012 chevrolet traverse, buick enclave, and gmc acadia vehicles currently registered in alaska, colorado, connecticut, delaware, idaho, illinois, indiana, iowa, maine, maryland, massachusetts, michigan, minnesota, montana, nebraska, new hampshire, new jersey, new york, north dakota, ohio, pennsylvania, rhode island, south dakota, utah, vermont, west virginia, wisconsin, wyoming and the district of columbia. snow or ice buildup on the windshield or on the wiper may restrict the movement of the wiper arm, causing the wiper arm to loosen and cause the wiper to become inoperative. Gm will notify owners, and dealers will tighten the wiper arm nuts, free of charge. the safety recall began on april 20, 2012. 11/26/08 Gm is recalling 16,667 my 2009 buick enclave, chevrolet traverse, gmc acadia, and saturn outlook vehicles for failing to conform with the requirements of federal motor vehicle safety standard no. 209, 'seat belt assemblies.' these vehicles may have been built with a safety belt buckle in the second or third row that is missing a rivet. Dealers will inspect the safety belt buckles in the second and third rows, and replace them if necessary. the recall began on november 26, 2008. owners may contact buick at 1-866-608-8080; chevrolet at 1-800-630-2438; gmc at 1-866-996-9463; saturn at 1-800-972-8876; or through their website at http://www.gmownercenter.com . Gm recall no. 08387.customers may also contact the national highway traffic safety administration's vehicle safety hotline at 1-888-327-4236 (tty 1-800-424-9153), or go to http://www.safercar.gov . 06/27/14 Engine General motors llc (gm) is recalling certain model year 2014 buick enclave, chevrolet traverse, and gmc acadia vehicles manufactured march 26, 2013, through august 15, 2013. in the affected vehicles, the engine control module (ecm) software may cause the fuel gauge to read inaccurately. 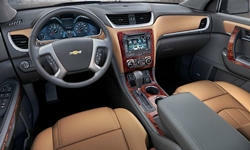 04/10/14 Transmission and Drivetrain General motors llc (gm) is recalling certain model year 2014 buick regal, lacrosse, verano, and enclave, and chevrolet impala, malibu, cruze, and traverse, and gmc acadia vehicles equipped with automatic transmissions. in the affected vehicles, the transmission shift cable adjuster may disengage from the transmission shift lever. as such, these vehicles do not conform to federal motor vehicle safety standard (fmvss) number 102, "transmission shift lever sequence, starter interlock, and transmission braking effect." they also fail to conform to fmvss number 114, "theft protection and rollaway prevention." 05/06/09 Brakes and Traction Control Gm is recalling 15,393 my 2009 chevrolet traverse vehicles for failing to comply with the requirements of federal motor vehicle safety standard no. 135, "passenger car brake systems." these vehicles may have a park brake cable link (connector) that is not to specification. this connector may fracture when the park brake pedal is depressed. If the transmission shift lever is in the park position, there will be no unintended vehicle movement. however, if the keys are left in the ignition, the transmission shift lever is in any position other than park, and the vehicle is parked on a sufficient slope, it could result in unintended vehicle movement. this could result in a crash without prior warning. Dealers are to replace the park brake cable link (connector) free of charge. gm anticipates that the dealer bulletin will be sent may 5, 2009 and owner letters will be mailed in june 2009. owners may contact chevrolet at 1-800-630-2438, or at www.gmownercenter.com. Gm recall no. 09045.owners may also contact the national highway traffic safety administration's vehicle safety hotline at 1-888-327-4236 (tty 1-800-424-9153), or go to http://www.safercar.gov . 09/30/15 Electrical and Air Conditioning General motors llc (gm) is recalling certain model year 2016 chevrolet traverse, gmc acadia, and buick enclave vehicles manufactured august 18, 2015 to september 24, 2015. due to a manufacturing defect, the windshield wiper motor may overheat when used. 12/26/14 Electrical and Air Conditioning General motors llc (gm) is recalling certain model year 2013-2014 cadillac cts, escalade, escalade esv, chevrolet suburban, tahoe, gmc yukon, and yukon xl, and 2014 buick enclave, chevrolet express, impala, silverado hd, traverse, gmc acadia, savana, and sierra hd vehicles. in the affected vehicles, the chassis electronic module may be internally contaminated, resulting in an electrical short. Gm will notify owners, and dealers will replace the chassis electronic module, free of charge. the recall began on december 26, 2014. owners may contact gm customer service at 1-800-521-7300 (buick), 1-800-458-006 (cadillac), 1-800-222-1020 (chevrolet), and 1-800-462-8782 (gmc). gm?s number for this recall is 14515. 06/27/14 Electrical and Air Conditioning General motors llc (gm) is recalling certain model year 2014 buick enclave, chevrolet traverse, and gmc acadia vehicles manufactured march 26, 2013, through august 15, 2013. in the affected vehicles, the engine control module (ecm) software may cause the fuel gauge to read inaccurately. 11/15/16 Other General motors llc (gm) is recalling certain model year 2008-2012 buick enclave vehicles manufactured january 3, 2007, to february 29, 2012, 2009-2012 chevrolet traverse vehicles manufactured july 6, 2008, to march 9, 2012, 2007-2012 gmc acadia vehicles manufactured september 15, 2006, to february 29, 2012, and 2007-2010 saturn outlook vehicles manufactured august 17, 2006, to march 18, 2010. the affected vehicles, equipped with the power liftgate option, have gas struts that hold the power liftgate up when open. these struts may prematurely wear and the open liftgate may suddenly fall. 01/28/16 Other General motors llc (gm) is recalling certain model year 2016 chevrolet traverse, gmc acadia, and buick enclave vehicles manufactured november 6, 2015, to november 12, 2015. the affected vehicles have a the third row left lower seat frame that may have welds that are not in the correction location. 03/09/15 Other General motors llc (gm) is recalling certain model year 2015 buick enclave vehicles manufactured december 9, 2014, to january 14, 2015, 2015 chevrolet traverse vehicles manufactured december 9, 2014, to january 20, 2015, and 2015 gmc acadia vehicles manufactured december 9, 2014, to january 16, 2015, and all equipped with goodyear p255/65r18 fortera hl tires. these vehicles are equipped with tires that may experience tread cracking. as such, these vehicles fail to comply with the requirements of federal motor vehicle safety standard (fmvss) no. 110, "tire selection and rims and motor home/recreation vehicle trailer load carrying capacity information for motor vehicles with a gvwr of 4,536 kilograms (10,000 pounds) or less." Gm will notify owners, and dealers will replace the tires that were manufactured within a specific date range, free of charge. the rec all began on march 9, 2015. owners may contact gm customer service at 1-800-521-7300 (buick), 1-800-222-1020 (chevrolet), or 1-800-462-8782 (gmc). gm's number for this recall is 15025/15067. note: this recall is for goodyear p255/65r18 fortera hl tires installed as original equipment. for tires that were purchased as replacement equipment, see recall 15t-002. 07/11/14 Other General motors is recalling certain model year 2009-2014 buick enclave vehicles manufactured april 14, 2008, through may 14, 2014, chevrolet traverse vehicles manufactured june 6, 2008, through may 14, 2014, and gmc acadia vehicles manufactured april 9, 2008, through may 14, 2014, and 2009-2010 saturn outlook vehicles manufactured april 14, 2008, through march 18, 2010. in the affected vehicles, the flexible steel cable that connects the seatbelt to the front outboard seating positions may fatigue and separate over time. 08/18/10 Other General motors is recalling certain model year 2009-2010 chevrolet traverse, buick enclave, gmc acadia, and saturn outlook vehicles. the second row seat side trim shield restricts the upward rotation of the safety belt buckle when the seat back is returned to a seating position after being folded flat. if the buckle contacts the seat frame, additional effort is required to return the seat to a seating position. if sufficient force is applied, the buckle cover could be pushed down the strap, exposing and partially depressing the red release button. Gm's recall no. n100243.owners may also contact the national highway traffic safety administration's vehicle safety hotline at 1-888-327-4236 (tty 1-800-424-9153), or go to http://www.safercar.gov .